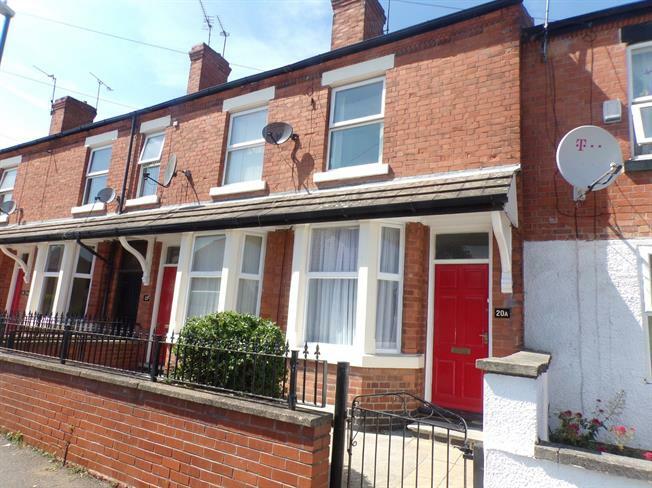 2 Bedroom End of Terrace House For Sale in Nottingham for Guide Price £90,000. Attention first time buyers! Two double bedroom bay fronted terraced cottage. The property benefits from an excellent location, No Chain and an enclosed rear garden. Accommodation comprises; living room with bay window, dining room , fully fitted kitchen , lobby area with storage cupboard for the boiler and family bathroom. Stairs leading to landing , first double bedroom and second double bedroom. To the front is a gated entrance to the front garden and to the rear an enclosed garden laid to lawn. Single glazed wood bay window facing the front. Double radiator, carpeted flooring, painted plaster ceiling, ceiling light. Double glazed uPVC window. Radiator, tiled flooring, painted plaster ceiling, ceiling light. Roll top work surface, wall and base units, inset sink with drainer, electric oven, gas hob, overhead extractor. Double glazed uPVC window with frosted glass. Radiator, tiled flooring, painted plaster ceiling, ceiling light. Standard WC, panelled bath, shower over bath, pedestal sink. Double glazed uPVC window. Built-in storage cupboard and boiler.